Carpal tunnel syndrome is a repetitive stress injury that interferes with the use of the hand. Often the dominant wrist is the injured one but in some patients both wrists can be involved. Symptoms are caused by the pinching/entrapment of the median nerve in the carpal tunnel. Symptoms include pain, numbness in the index, middle fingers and thumb, tingling in the hand(s) and pain shooting up the arm. Left untreated, the condition tends to worsen and can lead to permanent nerve damage. Since bones and ligaments have no “give”, this puts pressure on the nerve, which can be worsened by repetitive motion and tasks. Examples of repetitive motion include using a computer for long periods of time or performing assembly line tasks. 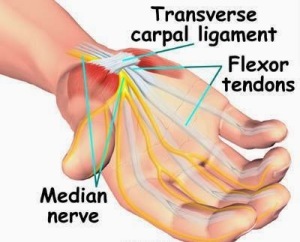 Middle age is the most common time in life for carpal tunnel syndrome to occur and there is a higher occurrence of carpal tunnel in females compared to males. Patients seeking treatment for repetitive stress injuries such as carpal tunnel do so because it is less invasive to its allopathic counterparts, which rely on medication and surgery. These factors cause the body to produce tough scar tissue that binds and ties down tissues, restricting movement. Over time scar tissue builds up, causing muscles to become shorter and weaker, resulting in a reduced range of motion, loss of strength and pain. Active release techniques are patented massage techniques that address problems with tendons, ligaments, fascia and nerves, which are often the result of overuse. All of Back to Health’s practitioners are certified in Active release techniques. Chiropractic treatment addresses all the possible causes of carpal tunnel syndrome. The key is in determining where the problem originates. If the condition arises from the wrist, chiropractic adjustments are used to restore motion to locked-up bones in the wrist, and soft tissue techniques are used on the muscles and tissues around the wrist to reduce any causes of nerve irritation. If the problem arises from the muscles irritating the nerve, then soft tissue techniques are used to break up scar tissue and relieve the nerve of excess pressure. In many cases, misalignments in the neck will cause irritation of the nerve. Chiropractic adjustments restore proper motion in the bones of the neck, thereby relieving the nerve of any compression. As the patient recovers, stretching and strengthening programs are prescribed to reduce recurrences. In some circumstances, an individual may suffer from nerve compression in both the wrist and neck; this is referred to as “double crush.” Fortunately, chiropractic addresses the origin of both problems. Acupuncture, in conjunction with other treatments, speeds up the healing process, and decreases inflammation. Acupuncture does this by stimulating the natural release of endorphins, which are the body’s natural pain killers. Dr. Rodwin is a certified acupuncturist and will recommend this method of treatment if it is warranted. Massage therapy relieves pressure on the median nerve by stretching the tissue responsible for the condition. Massage will reduce scar tissue and treat any muscular compensation that may be taking place. The wrist bones may be loosened through “joint play” techniques, and any swelling can be decreased with lymphatic drainage.